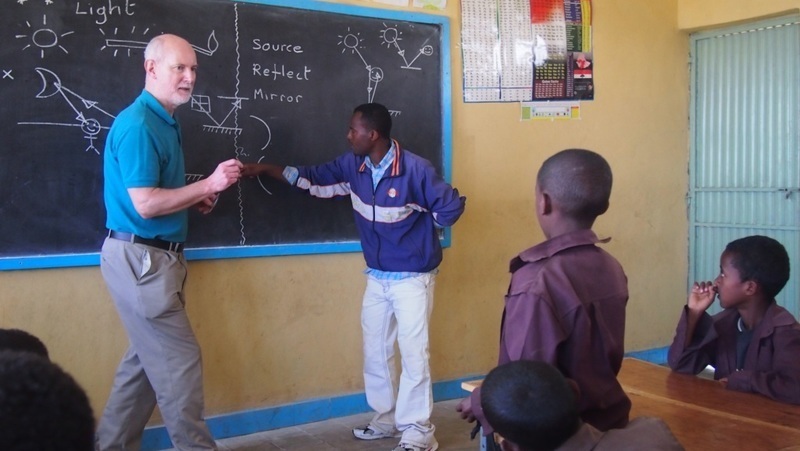 Saturday saw the arrival of a new team of volunteers at our Bethany School and Children’s Village in Ethiopia. The team were swarmed by children as they drew up to the school and their feet haven’t touched the ground since. Members of the team have been encouraging our teaching staff with fresh new ideas for English lessons, science, PE and ‘thinking skills’ and the students have been enjoying the new equipment and books brought from the UK. In one of the Science classes this week, the staff and students have been using magnets for the first time and making periscopes. In PE, the students have been enjoying a game of rugby (girls included) which is a new experience for them. The team have planned lots of fun activities for the children over the course of the next two weeks. As we showed yesterday, Elsa has received a new pair of shoes this week after Stand by Me took her to see a specialist for assessment of her short leg (full story here). The team have reported that Elsa is already walking better and full of smiles. You can see more photographs from the team’s visit on our Facebook page here showing school assemblies, the children enjoying their breakfast, new teaching in the children’s classes and more.